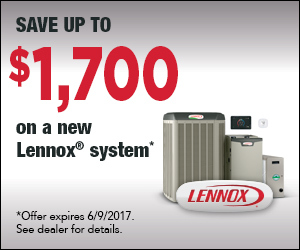 Beginning today, March 13th, the Lennox Spring 2017 promotion offers manufacturer rebates on certain units and system combinations. If you’ve been considering upgrading your heating and cooling system for better comfort and better efficiency, now is the time to do so to take advantage of these savings. Call us today to schedule a free in home quote or for more details. Also, be sure to check out www.lennox.com/residential to look at the lineup of Lennox systems.